12-18M/Asian Tag 80cm: Bust:23.6", Length:13.8", Sleeve:12.2"
18-24M/Asian Tag 90cm: Bust:25.2", Length:14.6", Sleeve:13.4"
2-3Y/Asian Tag 100cm: Bust:27.6", Length:15.7", Sleeve:14.6"
3-4Y/Asian Tag 110cm: Bust:29.1", Length:16.5", Sleeve:15.3"
4-5Y/Asian Tag 120cm: Bust:30.6", Length:17.7", Sleeve:16.5"
Please refer to our size chart in "product description" before ordering.Thank you! Material: polyester fiber, soft and breathable. 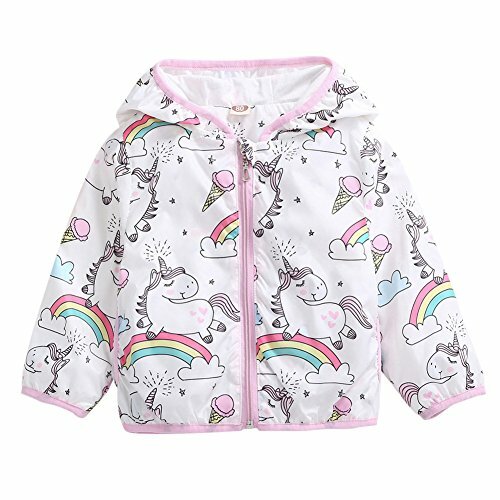 Vibrant cartoon pattern: heart, rainbow, unicorn, baby's favorite. Lightweight, hoodie, elastic cuffs and side pockets, zipper closure. Perfect for daily wear, school, party, camping, vacation and sport activities in spring, summer, early fall.